Dad was in town this weekend for some preventive maintenance for Numed and we stopped by the apartment to pick up the rest of my furniture. 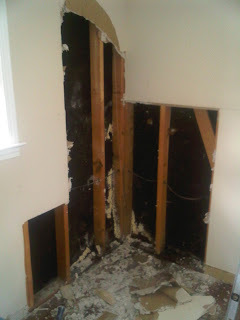 We moved that over to the house and took some time to tear into the corner of the house to identify the rot damage and what kind of tools we will need for the week after next for fixing that. 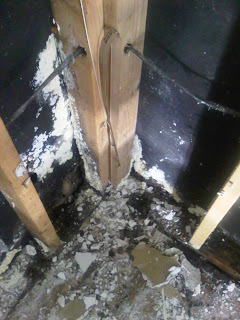 You can see where we tore out the sheetrock as well as the mold growth in the following pictures. I will post the renovation work starting this next weekend.